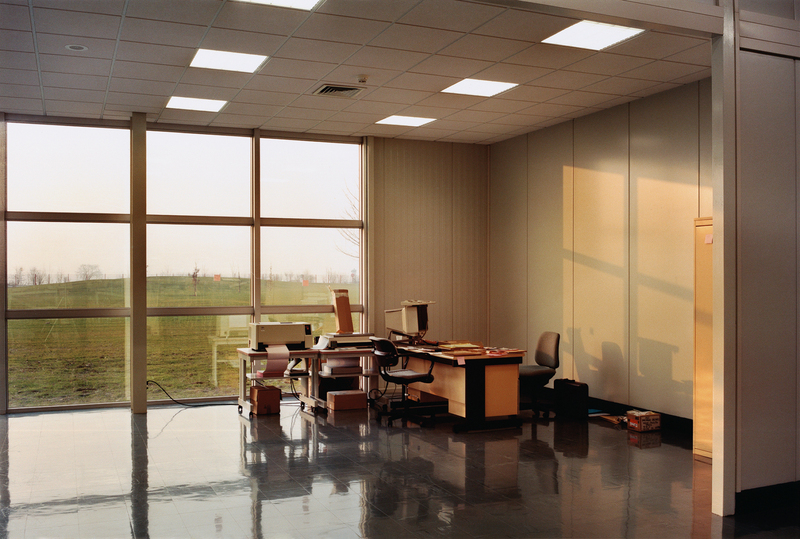 An office at the Mitsubishi headquarters in Vitre, France, from Lewis Baltz’s series “Sites of Technology” depicts a pristine, clinical interior, which is contrasted with an exterior lawn made to look natural. Except for the title, it’s hard to know what exactly happens inside this corporate/industrial space. The desks suggest projects, most likely with profit in mind. The reflected natural light on the floor and wall are juxtaposed with the grid of artificial neon lights overhead. Lewis Baltz was born in 1945 in Newport Beach, California. In 1967, at 22, he was shooting high-resolution black-and-white photographs, which he called Prototypes, of cars, building façades, and signage, things that were sprouting up across the American landscape in its greatest period of commercial growth. He set his camera on a tripod at eye level. He developed the film in his kitchen, carefully, incrementally. Later he photographed tract houses, industrial parks, and a peculiar choice of hardscrabble terrain vagues around the cities of Los Angeles and San Francisco. He showed the photographs in series, in a tight grid on walls. They were iconic; they brought together elements of Pop Art, Conceptual art, and minimalism. Those relevant connections brought him to the attention of the Leo Castelli Gallery, then certainly the most important art gallery in America, if not the world. At the end of the 1970s he was included in a traveling exhibition called “The New Topographics.” It wasn’t really a movement but Robert Adams, Steven Shore, and the German couple Bernd and Hilla Becher were among those included. Baltz’s black-and-white photographs have the compact and hieratic look of minimalism, but they are much spookier, as if he harbors suspicion about 1957 Chevrolets, real-estate establishments, hotel beds, tract housing, and industrial architecture — as if he wonders how and why we create such things, en masse, simply from the idea of consumer progress and how they have such power — so much so that we have to work hard to keep up with them, our own technology. In the mid-1980s Lewis started working in color. He also moved to Europe and has been living in Paris ever since. This move both to color film and to Europe didn’t change his critical perspective. He continued to combine an undeniable photographic talent with an anthropologist’s wonder about the world we live in. Both moves weren’t so much a vertical search for better or more idealistic imagery, but a horizontal move to broaden his worldview. His photographs have always been beautiful. They’re also haunted by the feedback loop that ricochets in contemporary minds between status, power (private, public, corporate, institutional), and the tacit acceptance of commercial growth. He doesn’t pass judgment, but a work like Unoccupied Office, Mitsubishi, Vitre, beautiful as it is, speaks volumes about the “normal” imperative for corporations to expand. But who serves whom? Do business and commerce serve us or is it the reverse? The fact that no people are in the picture, which is typical in his work, adds to the beauty of each image and to the strangeness of his subject matter: our growing world.